Do you struggle with mobility in your golf swing? No matter how fit we may be, we’re all bound to eventually lose some of our flexibility and range of motion. It could be the result of an injury. Or, as in my case, it could just be the side effect of getting older. If you’ve lost some of your mobility and your swing is suffering because of it, don’t worry. A lot of golfers come to my lesson tee with the same problem, and there’s always a solution. Whether your golf swing has gotten stiffer due to injury or due to age, I can help. I’m going to share three simple tricks to help you rediscover your old mobility and start hitting the ball farther. And in case those don’t help, I’ll also share one (slightly unorthodox) bonus tip that could still save your swing. First, let’s clarify the underlying concept that explains why these tips work. We tend to think of tension as a localized issue. That is to say, we think of a stiff elbow as only a stiff elbow. We’d still say we have full mobility in the wrist and shoulder. However, in the context of a golf swing, there is no such thing as a single restricted segment. A golf swing is not a seriesof movements, but a chainof movements, with each motion linked to the motions before and after. 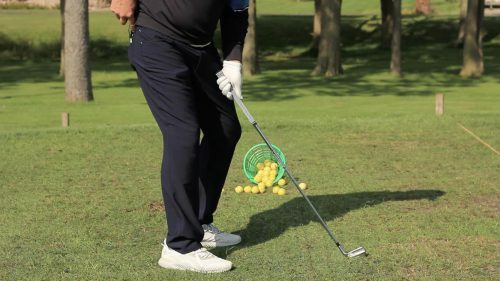 If any segment of your swing is locked down or too tight, both the segment that precedes and the segment that follows will suffer from that tension. On the other hand, if you’re able to gain mobility in one area of your swing, you’ll see the results spread to the entire chain. You’ll find a fuller range of motion, which generates more power, more speed, and more distance. So, don’t be fooled by the simplicity of the tips that follow. These small changes can amount to major improvements. Of all the tips in this article, this is the one that requires the least amount of thought and adjustment. It may also seem like the least important. But trust me, this one small change promotes mobility throughout your entire chain of motion. When you take your setup, you probably position your feet parallel to one another with your toes pointed straight ahead. Instead, try turning your toes slightly outward, away from one another. The degree of ideal outward angle varies from person to person, so you may want to play with it to see what feels most natural and effective for you. Most people find their sweet spot somewhere in the range of 20-30 degrees. This may seem like an inconsequential adjustment, but it can pay off significantly. When you square your feet, your ankles are locked, creating a lot of resistance. By flaring your toes out, you creating a relaxed base in your feet in ankles, promoting greater mobility throughout the rest of your body. I teach this tip to a lot of my golfers, including my best players. It’s a valuable trick for anyone, but it’s especially effective for anyone struggling to increase their range of motion. You may have been taught to bend your trail knee and lock it in place on your backswing. While this advice is fairly popular, I’d argue that locking the trail knee only hinders your swing. If you don’t allow the knee to straighten naturally with your swing motion, you restrict your mobility. Moreover, you create tension that affects your transition and downstroke as well. Remember: We’re talking about a chain of movements. When you tighten through one movement, you create tension in the motion before and after. To be clear, I’m not suggesting you fully straighten your leg on the backswing. I can’t speak to the exact degrees of bend, but to give you a sense of what I mean, let’s say your trail knee is bent at a 30-degree angle. On the backswing, you want to let your knee straighten to a 15-degree bend. So, yes, you are maintaining some bend, but you’re not forcing a deep bend when your body naturally wants to adjust for a longer swing. This third tip is not an active choice as much as it is an organic by-product of a good swing motion . . . and of following tips 1 and 2. Your hips will naturally want to turn with the swing. Regardless, it’s still a good idea to think in terms of allowingthis rotation. To get a clearer picture of what I mean by “turn,” think about the back packet on the right side of your pants. (That’s the right side for right-handed golfers. Reverse it if you’re left handed.) As you swing back, think of that back pocket moving backwards. Then, as your hips turn back with the swing, you can feel pressure shift from your lead foot into the heel of your trail foot. I love that move. 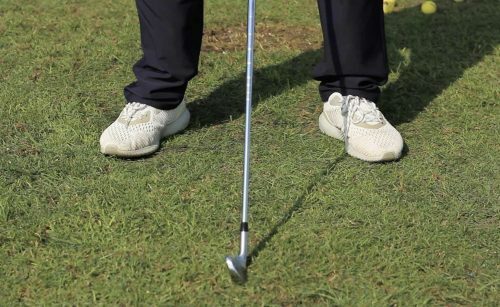 In one motion, you’ve created more mobility in your swing and loaded your trail foot with energy that will help you pack some power on the downstroke and through impact. So remember, as you think about rotating your torso and allowing that back knee to release, let your hips be part of the motion. Each of the preceding three tips should go a long way towards helping you regain some lost range of motion. However, there are special cases when even the best advice doesn’t work. Maybe you have an injury or a knee or hip replacement . . . something that precludes you from making any of these adjustments. There is still one more option for putting a little more distance in your golf shots. I will warn you, it’s a bit unorthodox. It’s also not necessarily in line with the preferred golf swing technique. However, this move is effective, and I have seen it help a lot of golfers. The trick is simple. Just bring your lead arm a little higher up on the backswing. That’s it. I know some of my golf instructor friends are going to disagree with me on this one. But I stand by it. Most of the time, a high lead arm is going to hit the ball farther than a low lead arm. In fact, some of the longest drivers on the Tour get that lead arm pretty high. Look at John Daly or Bubba Watson. Besides, if nothing else has helped, it may be time for a bold and unorthodox move. Take your stance with your toes pointed slightly away from one another. Let your trail leg release a bit in the backswing, rather than locking your knee in at one angle. Allow your hips to move through the swing. Think in terms of your right back pocket moving backwards (if you’re right-handed). If none of these adjustments work for you, try getting your lead arm a little bit higher through the swing. It’s not ideal swing technique, but if you’ve exhausted your options, raising the lead arm is a reliable way to get some distance back in your golf shots. Bottom line: Loss of golf mobility doesn’t have to mean more frustration on the golf course. With a few small adjustments, your swing—and your scorecard—can easily recover . . . even if you haven’t. Have you tried any of these tips? Did they work for you? Do you see anything here you disagree with? Let us know your thoughts in the comments. We love the discussion, whether you agree or disagree, so be sure to chime in. And be sure to follow us Facebook, Twitterand Instagram for more little-known tips and tricks to transform your game. Our primary goal is always to help you play better golf. And for helpful video tips, subscribe to our YouTube channel!